Perfect for Tax Day leafletting, as a focus for forums and panels and workshops and more! 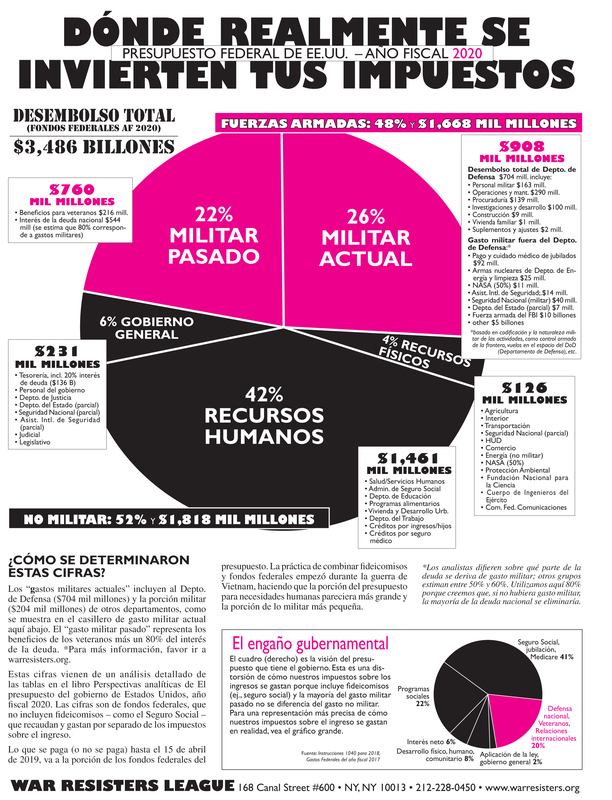 The new edition of the War Resisters League's famous "pie chart" flyer, Where Your Income Tax Money Really Goes, analyzes the Federal Fiscal Year 2020 Budget (FY 2020 is 1 October 2019 - 30 September 2020. This FY2020 issue has just been published. Order now, and we'll get them to you as soon as we can! Each year War Resisters League analyzes federal funds outlays as presented in detailed tables in "Analytical Perspectives" of the Budget of the United States Government. Our analysis is based on federal funds, which do not include trust funds - such as Social Security - that are raised separately from income taxes for specific purposes. What federal income taxes you pay (or don't pay) by April 15, 2019, goes to the federal funds portion of the budget. 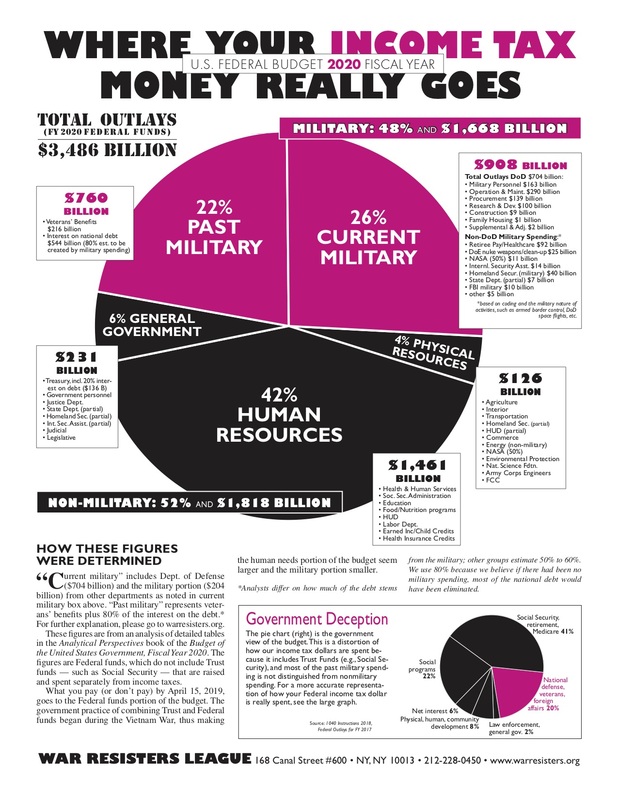 Leaflet with this flyer year-round and on Tax Day, April 15, 2019, and throughout the Global Days of Action on Military Spending, April 13 to May 9, 2019. Get involved in WRL’s organizing and education work: No SWAT zone: campaign to end police militarization, nonviolent direct action training, internationalism, counter military recruitment, resisting airwars, and more. Visit WRL’s membership handbook. 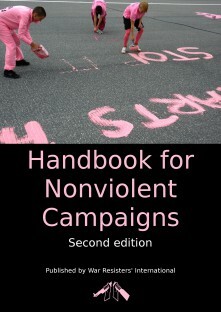 Find resources to challenge militarism, curb police power, strengthen nonviolent action and lift up community resilience! Write elected officials letters-to-the-editor, and posts online. Send and share copies of this flyer. Explain your budget priorities for a better world. Divest from war! Refuse to pay all or part of your federal income tax. Though illegal, thousands of people openly participate in this form of protest. Sign up at wartaxdivestment.org. Whatever you choose to re- fuse—$1, $10, 48% or 100%—send a letter to elected officials and tell them why. Contact us for information or referral to a counselor near you. Contribute resisted tax money to groups that work for the common good. For more about refusing to pay for war, sample brochures, and to watch the introductory film Death & Taxes, contact the National War Tax Resistance Coordinating Committee, (800) 269-7464 or see nwtrcc.org. Support the Peace Tax Fund bill: peacetaxfund.org. Order a DVD of NWTRCC's film, Death and Taxes from WRL's online store. Read and use War Tax Resistance: A Guide to Withholding Your Support from the Military, a 144-page handbook with history, methods and resources. Available for $5 plus postage from WRL's onlines store. You can also download the flyers and print them locally. We offer these downloads free of charge, but we really appreciate your donation to support the work of producing this important resource each year. If you can, donate today!